D.K. Metcalf is the most idealized specimen of a wide receiver one can find. He is tall, heavy, strong and extremely fast. At the wide receiver position, only three prospects clocked a faster or equal time. Mecole Hardman (4.33 s), Andy Isabella (4.31 s), and Parris Campbell (4.31 s) were the only ones to do it. Each wide receiver that ran a 4.33 or faster, however, was at least three inches shorter and 23 lbs lighter than Metcalf. In fact, the closest player on the 40-yard dash leaderboard with a height and weight within 1 inch and 10 lbs of Metcalf is Miles Boykin. He ran a 4.42. Metcalf’s speed should not be the only thing he is known for either. He tied N’Keal Harry for the most bench reps of any wide receiver at 27 reps. The closest behind the two was Jalen Hurd, who put up 23 reps.
Aside from his performance at the NFL Combine, one can look to the tape to see his amazing attributes in action. Metcalf owns the ability to get off the line extremely quickly. He also uses his hands to get out press coverage at the line of scrimmage. This enables him to break away from defenders quickly, hit his top speed, and make huge plays down the field. His physical attributes create a mismatch for nearly any defender that tries to cover him. He is not afraid to block and does it effectively as well. The combination of size, speed, and strength that D.K. Metcalf possesses is extremely rare. His measurables and in-game abilities make him one of the best prospects in this draft class, but there are concerns that cannot be ignored. Like any prospect, D.K. Metcalf has weaknesses that cannot be ignored. His most notable shortcoming is his tendency to drop passes. There are plenty of examples on tape where Metcalf is given the opportunity to make a catch, contested or uncontested, that ends with the ball on the ground. Metcalf seems to lack the mental awareness to concentrate on catching the football. Many believe that he is going to come into the NFL and instantly become a number one wide receiver, but he has never had a true #1 workload. Not only was he paired with great receivers like A.J. Brown, but just once did he finish a full season. His freshman year was cut short with a season-ending foot injury, and his redshirt sophomore campaign prematurely ended with a neck injury. The injury concerns are major, but there is one final weakness that should be addressed. D.K. Metcalf has a very limited route tree. From the tape I watched, he only ran go routes, comebacks, and screens. When he gets to the NFL, Metcalf will need to learn the full route tree. This could be difficult for a receiver who only knows three route patterns. D.K. Metcalf is one of the most athletically gifted and talented receivers I have ever seen come out of college. His size, speed, and strength make him a force to be reckoned with. He has an amazing ability to create mismatches and big plays, but he is not without weaknesses. He constantly is at risk of dropping the ball. His injury history is troubling, and he will need to learn more at the NFL level. With all points considered, D.K. Metcalf is one of the most interesting prospects of the class. He will either take the NFL by storm and become one of the game’s brightest stars or fall into obscurity as a bust. There is no clear way to discern whether he will boom or bust at the next level. A team will just have to take the risk and draft him. He has one of the highest ceilings of a wide receiver prospect in recent memory, but also one of the lowest floors. I split his comparison into two players to represent what he can become in the NFL. He creates mismatches like most others can only dream of and has the chance to become the next Julio Jones. But if he fails, he will end up like Breshad Perriman, an incredibly fast prospect with major injury concerns, and questionable catching abilities. Should the Baltimore Ravens Draft D.K. Metcalf? The Baltimore Ravens will not get the chance to draft D.K. Metcalf. Before the NFL Combine, he was going to be a late first-round pick. After the combine, however, he shot up draft boards and now looks to be a top-15, top-10 pick. If Metcalf slips to the 22nd pick, the Ravens will need to determine whether or not he is the best player on the board. If he is, Baltimore should trade back. 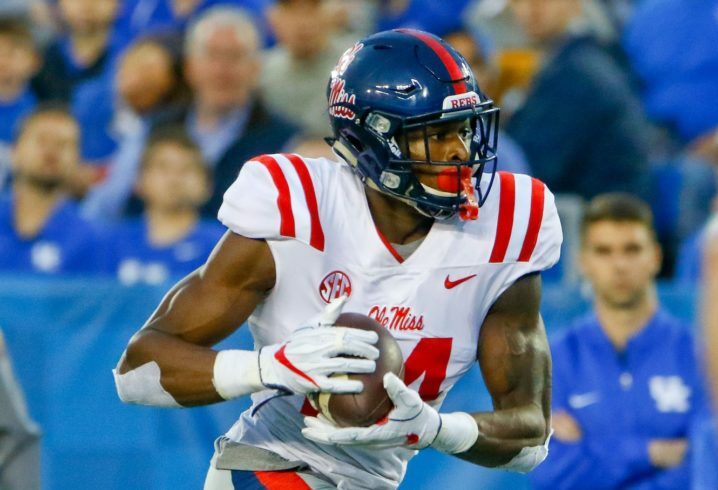 If the team wants to draft a wide receiver to immediately become number one on the depth chart, Metcalf would be too risky to take. Baltimore should only draft Metcalf if the Ravens have another receiver the team can count on as the leader of the group. With Michael Crabtree recently cut, Baltimore will need to dip into free agency to find one before the draft. D.K. Metcalf is simply too much of a gamble to be considered a number one wide receiver fresh out of college. In short, Baltimore should not draft D.K. Metcalf unless there is a backup plan in place.